Wow, what a crazy race! Sounds like a memorable experience though. I’m impressed with the couples who were holding holds. I can barely grip a dog leash while I’m running. Would you run another race in Daegu? Thanks for sharing! hey! nicely done, i’ve always wanted to run an 8-10km race…we’ll see. i’ll be headed to korea this summer (my first time) and this sounds amazing! i’m glad to have stumbled across this blog (: keep it up! Stumbled upon your blog. Love your post. My goal: Run one mile this year. No marathons in my immediate future. You inspired me to think about it though. We’ll see how it goes. lol! Well done you!! Very inspirational! What a crazy race, I’ve read articles about how crowded races in China, Korea and Japan can be loaded with people running “unconventionally” (holding hands, never ran before race day, etc). Congrats on a great finish time in a difficult environment! Thanks for sharing this experience. Now I know a little more about running races and what to expect when I decide to run in a race(which will be soon). Great post. I’m so glad to have found your blog – found you through the WordPress home page. My sister is a runner and I read this post aloud to her over the phone. We both found it so amusing! I’m looking forward to discovering more of your adventures in Korea! well done, looks like a nice experience! I’ve often had romantic notions about jogging up and down those Korean mountains my grandparents scale every day…but Korea being jogger un-friendly, I might have to let this dream just ferment inside my brain. I can’t imagine what it must be like to go for a casual run in the neighborhood…you’d have to flatten the people walking all around you. Congrats on your medal! And that dude shouldn’t have sprinted in front of you in the very end…that was just wrong. aha great read – well, at least it was an experience! congrats on the medal – you finished in great time. Your page came up on the front of wordpress and was interested to read your story. It was great! I hope some day I’ll be able to do a “fun run” in another country! Congrats–that sounds like some running experience. Fun post! I especially loved all your photos. You’ve inspired me to keep training for my 10K in 2 months. Hopefully the start wont be as crazy as this one! Ha ha. I had taken part in a 10 Km race a couple of years back and faced similar problems for the first 1 or 2 Kms. I took almost 72 min. to finish the race. I only got a certificate and no medal. There is another race in May. It will be the peak of summer. Lucky you. Great post and too funny! Most of the people that I see running in Seoul are doing it on a dreadmill. But, we are also lucky to have wide sidewalks and the paths by the river. Question: The couples holding hands…did their outfits match? Now that just sounds like it will lead to even more injury! @Adam – haha…surprisingly, I didn’t see many matching outfits. @HK: I’m glad you enjoyed the post. Good luck with your race!!! @dudetteinbrownsweater: Yes – it’s hard to run outside in Korea. You have to be on constant lookout for crazy cars and scooters. And there’s SO many traffic lights here (that take forever to change) – so you’ll be running one minute and then waiting for 3 or 4 minutes. @Gayle: You can do it!! It starts with one mile…and then two, and then a 5k fun run. Baby steps 🙂 Best of luck!! @Cheryl: What area of Korea are you headed to? And is it just visiting or to live there? I moved here in the late summer, so I don’t know yet what a real Korean summer is like – but I hear it is pretty brutal (heat and humidity). @Jen: Honestly, I wouldn’t run another race here. It was SOOO frustrating! If I was running with a bunch of friends and just wanted to goof around – then yes. The funny thing is, the Koreans are so used to things always being crowded, that they probably didn’t bat an eye to the craziness that was going on. Anyway! Great job! keep it up! I jog just for a bit of fitness here in Daejeon and have a fairly quiet 2km stretch of road that leads to a river. However, it can get ridiculously busy during the day, complete with illogical driving threatening to crush my feet and staring and pointing old men and women and children. Now I only run at night, when there is virtually no traffic (human or otherwise). Shame there aren’t any midnight marathons. Very Cool. I run with my sister in some half marathons and I have to agree that the beginning is insane, I couldn’t stand running like that the entire race. And that guy is smart (except chicken shitting u in the end), me and my sister pace ourselves behind someone that pushes us. Cool blog. 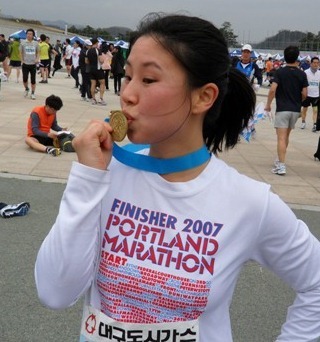 I found your blog by mistake and really enjoyed your recent post about running a race in Korea. I’m always freaked out before races, so I can relate to the frustration you felt! Oh my gosh!! !what an experience. Tera and I are doing Bloomsday in May and we are in the walking section. I just hope I can keep up with her and Isabella. We are supposed to finish NO FASTER than 1hr. 40min! You put me to shame!!!!! get ED to run too suz. Nice Post, I am studying Korean here and trying to find a place to run was impossible until I found a nice path along Olympic Park. Interestingly enough, even there its 99% Ajumahs wearing visors, covering themselves from head to toe making sure no sunlight hits their bodies. I feel unless I run 3-4 times a week (not fast, 3-4 miles only), this food will turn me into a Korean version of Homer Simpson. Hi Lisa, this is one of the things I want to do, if I get the chance to visit Korea sometime soon. =) I think it’ll be a great experience. haha. hi lisa, thanks for the reply (: i’ll be headed to seoul from june – aug. are you there? i don’t really know what to expect. I can speak basic Korean but can’t hold a proper conversation yet. How do you get around in Korea with just english? Hooray for you!! Holding hands must have made you laugh. It’s like you read through my head! Material realize a great deal about it, such as you submitted this book inside it or something like that. Personally i think which can be done with a bit of percentage for you to strength your message dwelling a bit more, but besides these very, that is definitely fantastic web site. An amazing understand. I will be rear. But, think on this, suppose you were to create a killer headline? I ain’t saying your information is not good, but suppose you added a post title that grabbed people’s attention? I mean Running (in Korea) is NOT fun | Much Ado About Lisa is a little vanilla. You ought to peek at Yahoo’s front page and see how they create post headlines to get people interested. Pretty great post. I simply stumbled upon your weblog and wished to say that I have really loved surfing around your blog posts. ideal, or too accomplished, or too boring i always don’t think We’re. His past and present leading ladies are all Latinas. infection. You may want to take an anti-viral medication as genital herpes treatments. there is a small window of opportunity for antiviral medicines. ” Today’s Internet Marketing world allows you to create and implement a marketing strategy for your product or service for very little money, especially when compared to traditional advertising models. In this Cosby Sweater Project, each episode offers different kinds of game to recreate his magic loud shirts. One of the catchiest tunes from Kern’s 1927 musical Show Boat is Life Upon the Wicked Stage. can be done so read on to find out more methods that are safe for adults to consider when losing weight. where the founder of the company is an infomercial guy. whiich consists off lots of useful data, thanks for providing these information.